Which exposure metering mode for outdoor photos? Which exposure metering mode to use? I noticed that search engine query come up in my web-stats – ‘which metering mode for outdoor photos’. So it might be a good idea to answer it specifically. Which metering mode should you use for outdoor photography? Or for that matter any kind of photography? The basic approach is quite simple: Since I’m using manual exposure mode nearly exclusively, no matter which route I take to get to a specific shutter speed / aperture / ISO combination … I would be getting the exact same exposure regardless of which metering mode was used. In this way, the metering technique is the essential factor, not the specific metering mode. Matrix / Evaluative, or Center-weighted, or Spot-metering? With this image, shot at 1/125 @ f8 @ 800 ISO, I metered off the large area in front of me. I held my camera horizontally, and zero’d my meter. I did make sure that I had more or less equal amounts of darker and brighter areas. I then zero’d my needle. Quite simple. Metering like this, is in effect the same as metering off an equivalent neutral tone, as described on this linked page. As mentioned on the page on exposure metering techniques .. There is no fixed recipe in approaching metering in all kinds of situations. It’s a mix-n-match of different techniques – all used to make sure I get optimum exposure for my images. With that iterative method, it doesn’t really matter which metering mode was used – I end up at the same place – the same aperture / shutter speed / ISO combination. So which metering mode do I actually use ? I mostly keep the camera set to matrix /evaluative metering, but I occasionally switch to spot metering. When I do use spot metering, I am specific about the tonality of the area which I am metering off. That is a very important consideration when you use spot-metering. I feel it is essential to also see that we have two broad areas of lighting here. The shadowed areas to the front of the image, and the sunlit area in the back. With the traditional approach to the Zone System and Black & White printing, we’d try to get everything to register in the final print. We’d want detail in the shadow areas, and still retain detail in the sunlit areas. Carefully working with the Zone System’s entire process, we’d be able to do that. However, with a single digital exposure (and not going to HDR technique), we have to make our minds up here which region we want to expose correctly for. 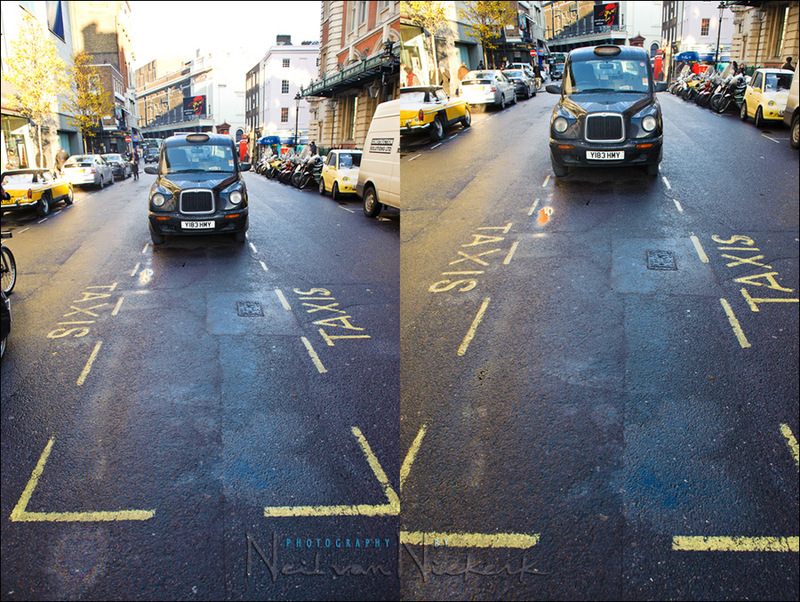 With a single in-camera exposure, we can’t expose correctly for both the shadow areas AND the sunlit areas. Even then, within those two differently lit areas, we will have brighter tones and darker tones. So it really becomes easier for us to get to correct exposure if we decide which of those areas is the most important, and expose for that. And that is what I did here – expose correctly for the areas in shade. I could have spot-metered off darker tones and brighter tones and averaged them out. But I chose a simpler method – find a neutral tone, or point my camera at an area which contains equal amounts of the various tonal values, and zero my camera’s meter. Dark and medium and lighter tones. By pointing my camera at those, I get an average. It worked. I could’ve used Center-Weighted metering, or just Matrix / Evaluative. Or I could’ve spot-metered off a neutral tone. It doesn’t really matter in the end. As long as I got to 1/125 @ f8 @ 800 ISO. I want to highlight this important point again – you can’t simply point your camera at a scene and zero your needle. You first need to decide what you want to expose correctly for, even if it is just a general area. 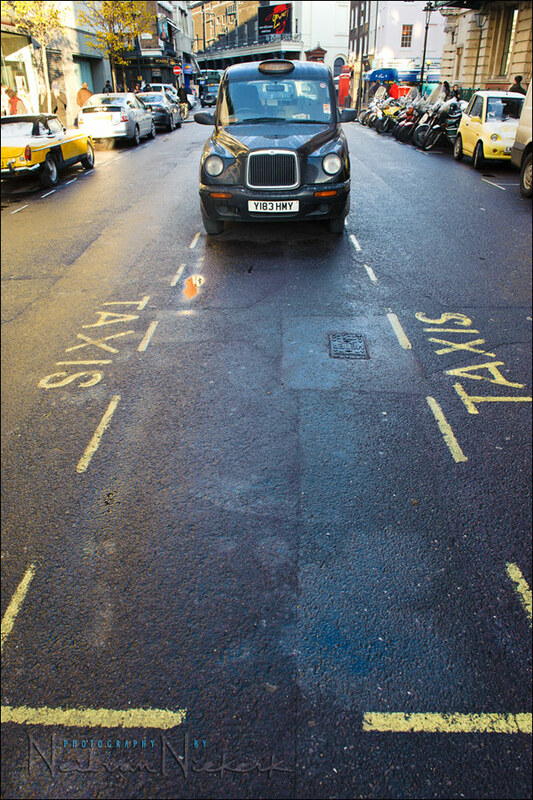 In the example of the photo of this taxi, the general area was the shaded area. I had to exclude the sunlit areas from my exposure metering … and my final composition. All of which is the long way of saying – the metering technique is more important than the specific metering mode. Thank you for this complex article, I have to read it again to fully understand it. Anyway, I believe that mainly, your experience is telling you what to do and how to think in a specific moment. Neil, I can’t believe how timely your post is on metering outdoors. I just shot an event last week (www.palmericreative.com/jasen)at which numerous photos were captured in bright late afternoon Arizona sunlight. What you describe is exactly what I had to do, i.e. decide which part of the scene I wanted exposed correctly. The bright skies were mostly blown out, to which I blended back in some blue tone in Photoshop. You are spot on in your advice about having to decide what you want exposed correctly in a scene, and then selecting settings that achieve that exposure. The most important thing to understand when talking about metering a scene is not which particular metering mode you choose (i.e., spot, center weighted, evaluative) but rather where do YOU choose to take the meter reading from that really maters. A reflective light meter – such as the one in your camera – will give correct exposure based on the assumption the metered scene reflects on the average 12-15% of the light back. That is why it gets thrown-off by extreme bright or dark scenes where it will underexpose or overexpose respectively, since the reflected light from these falls outside of the 12-15% assumption. 1. Get a handheld incident light meter, these are accurate (and quite useful in a studio setting), but work best when you can actually get close to the subject to take a reading. They are also an additional expense, although in my opinion if you are interested in studio flash photography a handheld meter with flash meter functions can make your work easier and easily reproducible. 2. Get an inexpensive “middle gray” exposure card and take your reading from it. This an easy and reasonable accurate method that can easily be implemented in the field. When doing this, exposure needs to adjusted by about +1/3 EV as these cards reflects more (18%) than the meter is calibrated for. A variation of this technique is what Neil teaches by looking for the relevant bright tone on the scene and “placing” it on the correct area of the histogram. If you take a meter reading from a white target (such as a bride’s dress on Neil’s case), this should produce a peak on the right-most area of the histogram. With the EV compensation at zero, this is more likely to fall close to the middle of the histogram and register as a greyish tone rather than white. To “place” it correctly involves increasing the exposure compensation enough to move this peak to the right – usually by adding between 1-2 EV to the metered exposure). 3. Learn to “see” middle tones on the scene from where to take a reading (which is what Neil explained above). The way I learned this was to use an exposure card to get a “correct” reading from the incident light, then use the spot meter to point at different colors/tones within the scene until I got the closest reading. Overtime this trained my eyes to quickly identify middle tones from which to get a meter reading, today I do it without thinking much about it. The exposure needle is set to + on the left and – on the right by default on the Nikons I have used. You have to go into the custom settings menu to flip the orientation. To my knowledge, the histogram has always been setting the brightest tones to the right. I haven’t had an actual meter needle in a camera for a while :-) ( well my old FE2 still works but it just collects dust…). I live in aperture priority outside and manual inside. Nothing is better than knowing your tools and their tendencies, whether we’re talking exposure, focus or whatever. When you absolutely KNOW what your camera does, dialling a bit of EV here and there or locking exposure on something and recomposing, becomes second nature. I love the quickness of Aperture Priority and I trust my camera meter, but only because I know what it does. What about a situation where you are having to shoot quickly under changing lighting conditions? Let’s say, an outdoor wedding in full sun but with lots of clouds passing in and out? Les .. I would then revert to Aperture Priority, and shoot in Matrix / Evaluative mode. Thank you Neil,Knowledge in capsule. I do read all your posts and I have to say that of all the writings or explanations of this topic I have seen that you have described this topic better than I have seen done before. This is the challenge for me – writing for a wildly divergent audience. I’d love to engage the newer more inexperienced photographers, but still offer something for the more experienced photographers. And on this topic of metering, I should mention that with every workshop I teach, there are at least 1 or 2 people who never realized that their camera has a metering display inside the viewfinder. That surprises me every time, but it’s true. So the concept of exposure metering is a whole new unexplored field for many newer photographers who started with digital cameras and auto-exposure. Hopefully I keep these topics interesting for everyone. With regard to this, wouldn’t the metering mode used change the way you would meter regardless? what i mean is, if you used spot metering on the area with varying tones, your metering area would be “narrower” and expose for the AF point you’re using, whereas if you used evaluative metering it would’ve metered for the entire region with varying tones. also, would you have zoomed tight to that region to force the light meter to ignore the rest of the scene? Yes. It does, so you’d have to be more precise if you wanted just that area to be exposed correctly. However, read further, you need to have commonsense here in that if the spot meter area is very dark, or very light, you need to compensate still with a – or + EV. Yes. Everything you see in the camera’s viewfinder would be taken into account and an ‘average’ exposure to what the camera has been programmed for is taken. Yes. Well, just taking into account the actual area you wanted exposed correctly, not necessarily a ‘tight’ zoom, just enough to get area you are after, making sure you did not grab just darker areas only, since with the camera’s programming, it would want to turn it all 18% grey, thereby making a darker toned area too light, if there is a lot of black areas in scene, you need to actually slightly under-expose again by 2/3+. Same with a predominately light area, like snow, sky, camera would think it’s too light and want to darken it down, so you need to increase exposure in that sense. Precisely what he did in getting the ‘tonal’ range, as in making sure it was not all dark, or all light, thereby being able to correctly zero the camera’s meter. The **key** words in his answer is find ‘equal’ amounts of tones. Thanks for the great articles Neil. I am struggling a bit with the exposure mode (matrix, CW, spot) as it specifically relates to my D7000 and SB-700. I have read where the SB-700 requires the camera to be in spot metering mode for the flash to function as TTL (instead of TTL-BL). Due to this, when shooting in low ambiant and trying to use spot meter to get TTL, I find that I am overexposing my subjects. Any ideas? Does this sound correct about the spot meter used with SB-700?